Design of SP networks in which the non-linear layer is applied to only a part of the state in each round was suggested by Gérard et al. at CHES 2013. Besides performance advantage on certain platforms, such a design allows for more efficient masking techniques that can mitigate side-channel attacks with a small performance overhead. 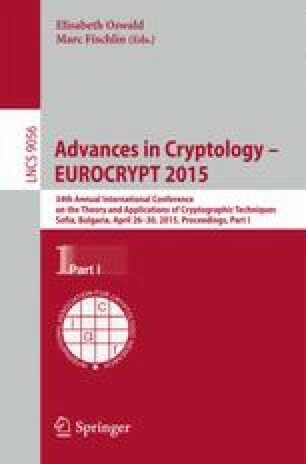 In this paper we present generic techniques for differential and linear cryptanalysis of SP networks with partial non-linear layers, including an automated characteristic search tool and dedicated key-recovery algorithms. Our techniques can be used both for cryptanalysis of such schemes and for proving their security with respect to basic differential and linear cryptanalysis, succeeding where previous automated analysis tools seem to fail. We first apply our techniques to the block cipher Zorro (designed by Gérard et al. following their methodology), obtaining practical attacks on the cipher which where fully simulated on a single desktop PC in a few days. Then, we propose a mild change to Zorro, and formally prove its security against basic differential and linear cryptanalysis. We conclude that there is no inherent flaw in the design strategy of Gérard et al., and it can be used in future designs, where our tools should prove useful. Achiya Bar On—The research of the first author was partially supported by the Israeli Ministry of Science, Technology and Space, and by the Check Point Institute for Information Security. Orr Dunkelman—The third author was supported in part by the German-Israeli Foundation for Scientific Research and Development through grant No. 2282-2222.6/2011. Virginie Lallemand—The fourth author was partially supported by the French Agence Nationale de la Recherche through the BLOC project under Contract ANR-11-INS-011. Nathan Keller—The fifth author was supported by the Alon Fellowship.